UPDATE: Hurricane Florence is bearing down on North Carolina but not as much as one weather reporter would have you believe. A local reporter has been panned online for hamming up just how strong the winds were during a live TV cross. As he stands, legs apart, bracing himself against the wind and appearing to struggle just a bit, two other young men casually walk by in the background - somewhat breaking the illusion. A video of the moment has spread like wildfire online. While the reporter has faced scorn from some, for others it brought much needed comedic relief during the deadly storm. UPDATE: A mother and infant were killed in Wilmington when a tree fell on their house as Hurricane Florence crashed into North Carolina on Friday, swamping streets with torrential rain and a powerful storm surge. 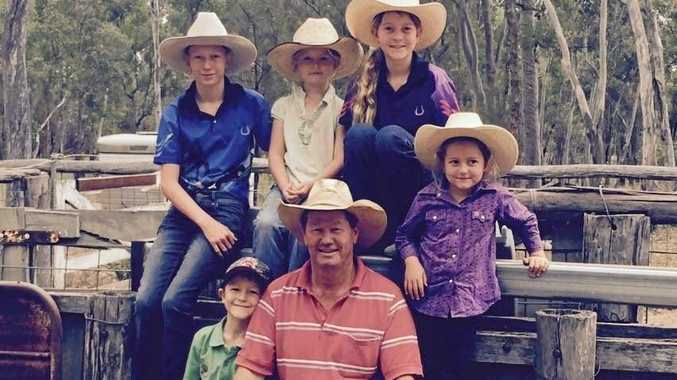 Police said they were the first confirmed deaths directly related to storm, while the child's father was taken to the hospital. A third person died of a heart attack inside her Hampstead home as the storm rolled in, Pender County Emergency Management director Tom Collins told local station WWAY 3. After landfall, Florence slowed to a pace that meant it would plague the area with days of flooding. As of 2pm local time, the hurricane was about 35 miles west-southwest of Wilmington, according to FOX News. The hurricane's storm surge - the wall of water it pushed in from the Atlantic - "overwhelmed" the town of New Bern at the confluence of the Neuse and Trent rivers, North Carolina Governor Roy Cooper said. "To those in the storm's path, if you can hear me, please stay sheltered in place," he said at a news conference in Raleigh, adding that Florence would "continue its violent grind across the state for days." The centre of the hurricane's eye came ashore at about 7.15am EDT near Wrightsville Beach close to Wilmington, North Carolina, with sustained winds of 150km/h, the National Hurricane Centre said. By 1.50pm the winds had dropped to 120km/h and the centre was moving west at a 10km/h, the NHC said, and parts of North and South Carolina would get as much as 1m inches of rain. Cooper said Florence was set to cover almost all of North Carolina in several feet of water. As of Friday morning, Atlantic Beach, a town on the state's Outer Banks barrier islands, already had received 76 cm of rain, the US Geological Service said. About 50cm were reported by early Friday afternoon in the town of Oriental. The NWS predicted Florence could drop up to eight months' worth of rain in two or three days. 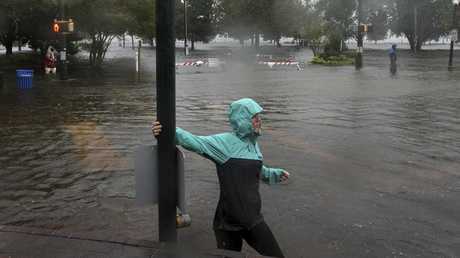 Authorities in New Bern, a town of about 30,000 people dating to the early 18th century, said more than 100 people had to be saved from floods and that the downtown area was underwater. Calls for help kept coming in as the wind picked up and the tide arrived, said city public information officer Colleen Roberts. "These are folks who decided to stay and ride out the storm for whatever reason, despite having a mandatory evacuation," she said. "These are folks who are maybe in one-story buildings and they're seeing the floodwaters rise." Florence also blew down trees, including one that went through the roof of Kevin DiLoreto's home in Wilmington. He said all roads leading to his neighborhood were blocked by fallen trees. "It's insane," he said in a phone interview. "Everybody laughs at the fact that this storm got downgraded … but I've never seen tree devastation this bad. "Afterwards, I'm going to drink a bottle of whiskey and take a two-day nap, but right now I'm walking the neighborhood and making sure my neighbors are fine, because nobody can get in here." "It looks heavy outside," she said. "I'm a little bit scared right now, but I have my iPad and I'm watching Netflix." In the Philippines, evacuations were under way with Super Typhoon Mangkhut expected to hit on Saturday in an area impacting an estimated 5.2 million people. EARLIER: HURRICANE Florence has made landfall near Wrightsville Beach, North Carolina. The storm reached land about 7.15am (eastern daylight time) as a Category 1 storm with estimated maximum winds of 150km/h. Ahead of the arrival of the story, flights have been cancelled and almost 11 million Americans were put under storm watches and warnings. The storm had already begun lashing North Caroline with rain and wind and water was expected to be the hurricane's deadliest threat. Forecasters say Florence packs a catastrophic amount of it. Officials have been begging holdouts in evacuation zones to seek shelter, including a police chief on a barrier island in Florence's bullseye who asked for next-of-kin contact information from the few residents who refused warnings to leave. The huge storm is about 645km wide and its hurricane-force winds stretch for 255km. Forecasters are predicting heavy rain in parts of the Carolinas, flooding and winds of about 160km per hour, which is about 18km below the threshold for a "major" hurricane but is still extremely dangerous. As of Thursday afternoon about 12,000 homes had lost power in North Carolina but Duke Energy anticipates between 1 and 3 million homes and businesses could go dark. NEW: North Carolina transportation official warns the "conditions will continue to get worse over the next three-to-seven days." If Florence doesn't wipe out oceanfront homes perched on stilts along the Carolinas coast, rising sea levels likely will. The hurricane is hitting low-lying barrier islands that experience some of the fastest rates of sea level rise observed anywhere in the world, nearly an inch a year. Fast response crews from California, Florida and New England have converged on the Carolinas to be ready to move into damaged areas once it's safe to do so. Inflatable Zodiac boats, all-terrain vehicles and mini-bikes are among the equipment some teams such as the Oregon Air National Guard's 125th Special Tactics Squadron brought in. The Virginia National Guard has 1200 personnel ready to respond for missions including high water transportation, debris reduction, commodity distribution, shelter management assistance and search and rescue. Meanwhile the mayor of Hurricane in West Virginia has offered a North Carolina couple Marsha Bradbury and Jon Gillenwater, a unique opportunity to use his city hall for their wedding ceremony on Sunday after the storm threatened their nuptials. About 1600 animals at the North Carolina Zoo are hunkered down. Zoo workers moved elephants, giraffes, chimpanzees and hundreds of other species indoors for safety. But spokeswoman Diane Villa says some animals, including bison and elk, will stay in fenced-in yards instead of barns because they don't like being in fully enclosed spaces. A crew of zookeepers, veterinarians and park rangers will ride out the storm with the animals. Scientists can't say - yet - that climate change helped make Florence worse. But previous research has shown that the strongest hurricanes are getting wetter, more intense and intensifying faster due to human-caused warming. Studies also have shown that storms are moving more northward and slower both issues in Florence.